In the semiconductor industry, where technologies and business models change extremely fast, Advantest has always been on the cutting edge of progress with the world's best product and solution development capabilities, and unmatched technical support delivered through global teamwork. Advantest offers solutions for a wide variety of semiconductors and test needs, from SoC and memory, to R&D evaluation and system level test. Among these sectors, we have established a dominant market position in the mass production test market for high-speed devices such as DRAM, computing devices, and communication processors, which demand the most reliable test technology performance. In addition, our modular test platforms, which make it easy to test a wide variety of devices, enable speedy and flexible support for customer businesses. Over many years, Advantest has built strong partnerships around the globe with a wide range of semiconductor suppliers ranging from IDMs to fabless, foundry and OSAT companies, as well as universities and research institutes. Worldwide, almost all the companies that specialize in advanced semiconductors are Advantest customers, and we continue to push the envelope of the next generation of test technologies in partnership with our customers. In particular, we have a strong presence in Asia, where markets including Korea, Taiwan, China are expected to continue growing. 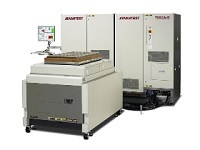 Advantest provides one-stop shopping for the test systems, test handlers, and device interfaces which are essential to semiconductor package test. We support globally distributed semiconductor supply chains from locations around the world. Our decades of commitment have earned us broad-based customer trust. American market research firm VLSIresearch’s annual customer satisfaction survey has named Advantest for 30 consecutive years as a member of the "10 BEST" semiconductor manufacturing equipment suppliers, recognizing us as a supplier with excellent customer satisfaction.